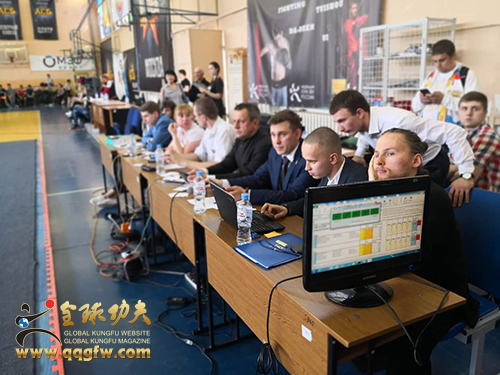 Global kung fu network news recently: the Russian national kung fu championship held in Moscow grand. (a) Mr. Magomed Kizriev, Head of the Security Service of Dagestan, Russia; Mr. Kameili, Vice-President of the International Kungfu Federation and President of the Russian Kung Fu Federation Vladimir, President of the Barnaul Kung Fu Federation; Ms. Tianxiufeng, Secretary-General of the Russian Kung Fu Federation Natalia, Vice-President of the Military Association of the State and President of the Quang Ying Martial Arts Corporation; The leaders and guests of the Wuzhou Association and the head of the Kirin Boxing, Mr. Liulianjun, attended the opening ceremony. 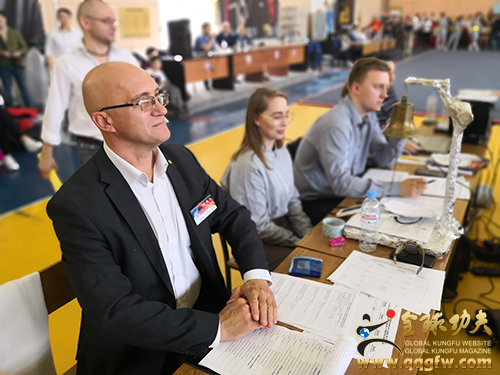 The tournament attracted a total of 36 teams and more than 400 athletes from various cities and regions in Russia. The competition is divided into four items: Kung Fu martial arts, KFF kung fu fighting, wrestling, and fencing. On the same day, the contestants 'morale was high and their style was released, bringing an unparalleled kung fu feast to the Russian audience. The United Nations goodwill envoy, chairman of the China private economic international cooperative Chamber of commerce, special vice chairman of the ninth session of the Chinese martial arts Association, and chairman of the international kung fu federation, Mr. Fubiao, congratulated Russia on the National kung fu championship. He said Russia is a country with a long history and a beautiful romance. Martial arts is a body language that spans ethnic and regional areas and conveys the spirit of self-improvement, advancement, and peace. We martial artists should respond positively to the “One Belt and Road Initiative” strategy and work hard to build the Silk Road for martial arts culture. Russia is one of the most beautiful countries of the Silk Road. We extend and promote the spirit of Silk Road through martial arts kung fu, and use martial arts to help the growth of the global economy. The Chinese Chamber of Commerce and International Cooperation for Private Economy and the International Kung Fu Federation have always contributed to the great development and prosperity of the Chinese martial arts industry. They are jointly committed to improving the physical quality of people in various countries through martial arts. Set up Taiwan with martial arts, develop a market economy, and become the economic and cultural highlight of the "Belt and Road". Technology is the first basis for the development of any sport in the world; In the process of disseminating technology and promoting, publicizing, and developing, the economy is also the first basis for the development of sports. Without an economic basis, the development of any sports undertaking is difficult. Therefore, we martial artists must learn economics, use economics, play economics, and create economics. Only when the economy is upgraded can our cause be realized, expanded and strengthened. I have summed it up: there are three kinds of human forces: thought, culture, and spirit. Wushu is the combination of thought and body language, the combination of art and aesthetics, the combination of power and skills, and the development of the human brain and limbs in coordination with each other. It is a science and technology that bolsters the spirit and will of all mankind. The promotion of a country's culture can sublimate the idea of a nation; The revival of martial arts can boost the national spirit of a country. An ideological nation means people with ideals, goals and hopes only that can make this country more and more powerful! To govern the country govern the family, they can not do without the spirit of ideology and culture. Through the ideological and cultural spirit to enhance people's social responsibility, social influence, social visibility, social values, social image, social status, personality charm, through the ideological and cultural spirit + economy, finally let the people of all ethnic groups in the world enjoy the health and happiness brought by martial arts!